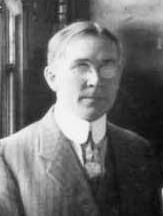 Carleton Monroe Winslow (1876–1946) arrived in San Diego on September 5, 1911, from Goodhue’s New York office and became the Exposition’s architect in residence. Goodhue supplied Winslow with drawings and photographs of buildings in Mexico and Spain and reviewed his designs for the temporary buildings. Winslow designed the Mission-style Administration Building, Indian Arts and Kansas Buildings; the Spanish Renaissance–style Science and Education Building; the Spanish Plateresque–style Home Economy Building; the hybrid Persian-functional-style Botanical Building; the Mexican Churrigueresque–style Varied Industries and Food Products Building; the Baroque-style corner entrances to arcades; and the neoclassical-style Seal of the City of San Diego on the crown of the arch of the West Gate. The Southern California Counties Building, a massive structure at the northeast end of the Prado axis, was a collaborative effort of Bertram G. Goodhue, Carleton M. Winslow and C.L. Wilson, from the Southern California Counties Commission. Winslow was a talented decorator who worked best when his designs came from his imagination rather than from copybooks. The allegorical tableau on the east side of the Varied Industries Building, the tablet in honor of Father Serra on the apse end of the Food Products Building and the geometric shapes on the patio tower of the Science and Education Building displayed his abilities.